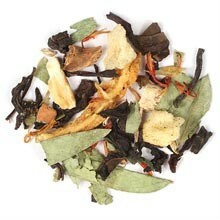 Diana's Papillion Tea Shop - Our Teas and Inclusions - What's the "Skinny" on Skinny Tea? For best results consume with an additional glass of water. This tea contains a moderate level of caffeine. Blended with oolong tea, yerba mate tea, green tea, senna leaf, apple pieces, ginger, cinnamon, orange, dandelion root, natural cinnamon flavor, natural creme brulee flavor and safflower.